This is my first Daring Cooks Challenge. I joined the Daring Bakers because I love to bake, and although I love the baking challenges that we’ve done so far, I wanted to try something a little tougher. Enter the Daring Cooks. Baking comes naturally to me, cooking does not. The Daring Cooks will definitely push me to try things I would never otherwise do. December 12th is my moms birthday. Since she already had dinner plans (busy girl) I decided to make her and my family Eggs Benedict for brunch. Eggs Benedict are opened faced sandwiches traditionally made with English muffins, Canadian bacon, poached eggs and Hollandaise sauce. You may have seen poached eggs on my blog before, like here and here, but I’ve always used a poach pod to make them. Now that I’m a Daring Cook I had to do it old school, that is, poor ’em into some hot water and hope for the best. Actually that’s not technically true. 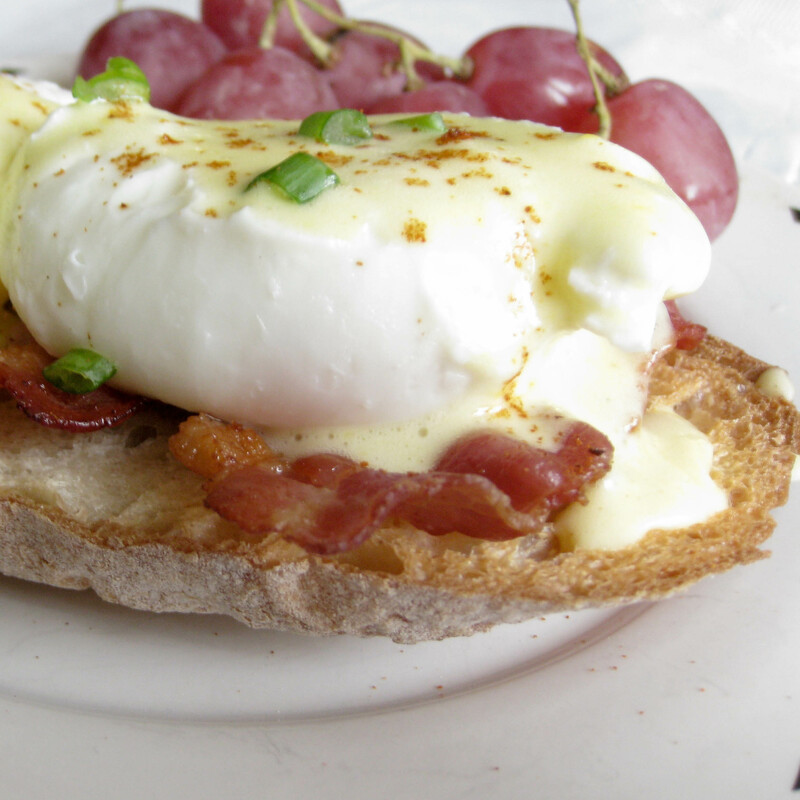 I did a lot of research to figure out the best way to poach an egg, and as luck would have the episode of Good Eats where Alton Brown makes Eggs Benedict aired on Food Network Canada a week before I planned to make them. Armed with this knowledge I felt pretty confident about the eggs. I was still pretty nervous about the Hollandaise sauce though,as overcooking the eggs is really easy to do. I used a loaf from Premiere Moisson instead of the english muffins, mostly because I forgot to buy the muffins. I also used regular bacon instead of Canadian bacon, (I have to say that as a Canadian I have never actually had Canadian bacon). I started the process by cooking the bacon. Next I made the Hollandaise. For a few moments I was worried that I had curdled the eggs, but I whipped like a mad woman and managed to save them. Next I poached the eggs in a very large pot with four small bowls placed in it, as Alton suggested when poaching for a large group. I toasted the bread while the eggs poached then assembled. I have to say I was quite pleased with the results. My first Hollandaise was rich and creamy, my eggs were cooked to with a slightly runny yolk (just how I like them), and the bacon was .. well it was bacon. You can’t really go wrong with bacon. The only issue I had was it was a little difficult to remove some of the eggs from their bowls, I broke two of the yolks. Make Hollandaise. Set up a double boiler; fill a large sauce pan with 1 inch of water bring to a boil then simmer. In a mixing bowl that will fit over the sauce pan whisk the egg yolks with the tsp of water until the colour has lightened, about 3 minutes. Add the sugar then whisk for 30 more seconds. Place the bowl over the sauce pan and whisk for 2 to 5 minutes until the mixture coats the back of a spoon. Take the bowl off the heat and add the butter one piece at a time, whisking until it is completely incorporated, place the bowl back over the simmering water if necessary to ensure the butter melts completely. Stir in the lemon juice, salt and cayenne. Poach the eggs: Place four small bowls in a large pot, fill with water until the bowls are covered by a quarter inch. Add vinegar and salt to the water. Bring to a boil then remove from the heat. Add one egg to each bowl the cover and let sit for 7-8 minutes for a runny yolk, longer if you prefer the yolks to be more cooked. Remove the eggs with a slotted spoon. Assemble the sandwich: Place a few pieces of bacon on each slice of bread, top with poached eggs and pour Hollandaise sauce over eggs. Sprinkle with cayenne and garnish with green onion. Oh I love eggs benedict, your one looks fantastic, especially the hollandaise sauce! Great job! This looks like something I could eat….every morning!? I love love love eggs benedict! I really want to join Daring Cooks now! This is one of my favorite breakfasts of all time and is this really your first time with the dish? Splendiferous! Perfect. My husband made it for me last spring. He thought it would be easy… tee hee. The photo makes me want to make some…now! That looks like a great old school poached egg! The whole thing looks delicious. I’m actually craving eggs benedict now! The media frenzy asganit the Holy Father has gained such a momentum that the pope’s safety can’t be guaranteed. I think it would be a good idea if, after every Mass, the novena to the Holy Father which began on 11 April and which will continue until the 19 April, is recited after every Mass. The Latin Mass parish in Melbourne has already begun the novena.NOVENA and PRAYER FOR POPE BENEDICT XVILord, source of eternal life and truth, give to your shepherd, Benedict, a spirit of courage and right judgment, a spirit of knowledge and love. By governing with fidelity those entrusted to his care, may he, as successor to the Apostle Peter and Vicar of Christ, build your Church into a sacrament of unity, love and peace for all the world. Amen.V/ Let us pray for Benedict, the pope.R/ May the Lord preserve him, give him a long life, make him blessed upon the earth, and not hand him over to the power of his enemies.V/ May your hand be upon your holy servant.R/ And upon your son, whom you have anointed.Our Father. Hail Mary. Glory Be.In Solidarity With Our Holy Father and please pray this prayer each day till 19.04.2010 the anniversary of the Holy Father’s election. Great job! Your eggs benedict look fantastic!! Beautiful job! Welcome to the Daring Cooks, you are going to have so much fun! You have a very lucky mom. It looks wonderful. And bread from Premiere Moisson is my idea of heaven! (I’m obsessed with their chocolate chip bread) Glad it worked out so beautifully! Hello and welcome to the Daring Cooks’ and congratulations on your first very successful challenge and I hope all your future challenges go just as well. What a wonderful treat for the your mum’s birthday and it looks smashing I like the grapes also. Well done on this challenge. That looks like the perfect eggs benedict! Looks like you’ve nailed the daring cook’s challenge, for sure! I absolutely love eggs benedict. It is probably my favourite breakfast, but I’ve never made it myself. You’ve inspired me to give it a try. This seems to be an easy to make recipe, but the picture is absolutely amazing! that looks really amazing, I just want to take a bite! I’m not much of a cook but I’ll gladly join the Daring Eaters Challenge if this is what I have look forward to eating!